E! 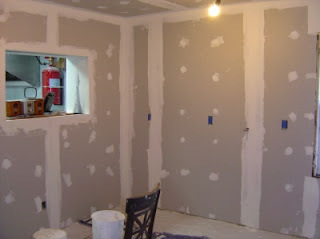 was busy slapping, er rolling, the final coat of paint onto the wait station walls. Myself I built the trim for the entrance to the bathroom hallway. 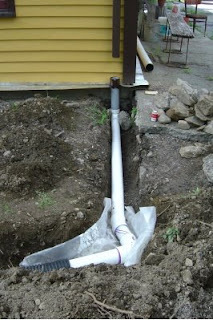 I neglected to tell you about news on the septic / water front. This week we finally received the results of our water tests, and for most part they were good. There were three areas which were off with respect to the limits acceptable for using a UV system, one of which being that we now have much harder water than before. We're going to run the results by the health department on Monday and see what they think about it. 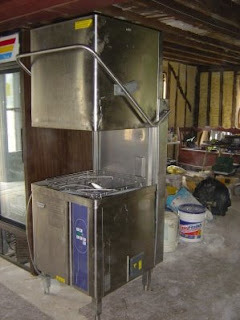 In every commercial kitchen there are at least three kinds of large-scale equipment: cooking, refrigeration, and ware washing. 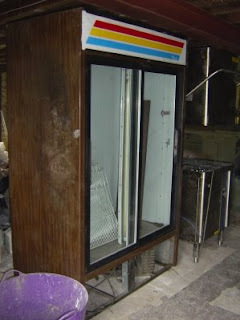 Although we already have most of the equipment in all three categories, we went out today and bought a dish washer and a refrigerator. Hold it, you say, I can see that there's never enough refrigeration in a restaurant (and I say, I taught you well), but don't you already have a dishwasher?! Oh you clever readers you, who read every word I write ... grrr!!! Yes, we already have a dishwasher, but when we bought it we were young and stupid (today we're old and stupid), and didn't realize that albeit the dishwasher was 3-phase (in its previous life) it had been converted to single phase, in particular the 3-phase motor had been replaced with a single phase motor. The amount of money it would take to convert it back to 3-phase (by replacing the motor) is prohibitive, in fact you can by a used dishwasher for just a few bucks more. Aside from the 3-phase issue, our present dishwasher would have required a booster heater, and, let's face it, it's more than 30 years old! Our new dishwasher doesn't have any of these problems, it's 3-phase, it has a built-in booster heater, and it is only a few years old. We came back from our week-long vacation to the Hamptons yesterday, and today it was back to the mill. Nothing had changed at Gunk Haus, no elfes or fairies had been busy picking up the pieces we had left behind (maybe I should start believing in fairies again, and of course Santa, not sure if the Easter Bunny would be helpful, but if he's a hard worker I'm going to put him on my list as well). E! 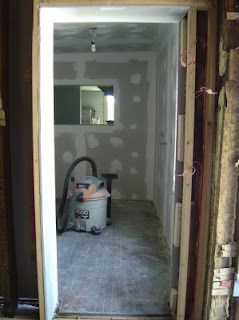 was busy in the wait station sanding the joint compound. 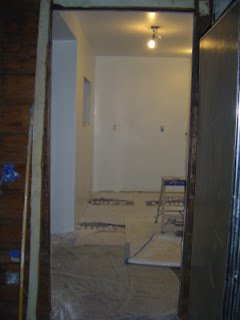 Soon she'll start priming and painting, if not tomorrow then by Tuesday. 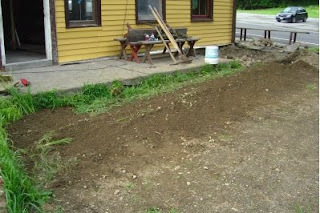 As a warmup exercise I engaged in my favorite pastime, digging trenches. I had already dug one out in the Biergarten to divert the gutter runoff onto the street, but it was pointed out to me that this isn't a good idea, because ice could form on the street in the winter (I already knew that because we had this problem last winter). 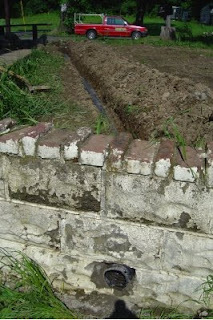 Originally I wanted to drain the water out on the western side of the Biergarten (don't ask why I didn't stick to my original plan), and today I implemented the original plan. 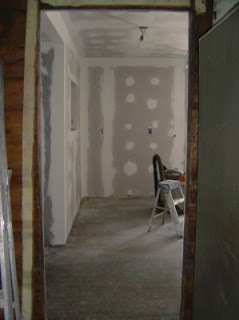 After taping and spackling comes sanding. It should be called dusting, because there's no sand, but there's a whole lot of dust. At the end of the day E! looked like she had fallen into a flour bin. E! 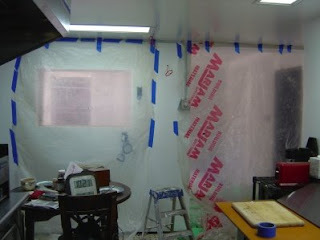 cordoned off the kitchen to protect it from the dust. Remember, we live here and it's a good idea to keep some areas somewhat clean (let's call it cleaner, as it's all relative). 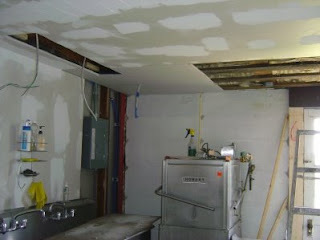 Another day at Gunk Haus, and the hard work continues. And to prove it, here are two pictures showing the same two views of the wait station as yesterday. I assume you instantly notice the difference (no, Mark, it's not that the lights are on). Ok, so you may not notice the difference, but I can assure you E! 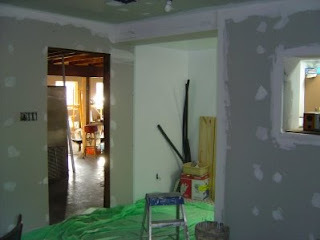 spent another day hard at work, taping and spackling, and yes, a little cursing and swearing. If you ever wondered what difference 150 feet can make: Our neighbors Lisa and Larry, who I introduced to you last year, had their well drilled yesterday and today. I am guesstimating that their well is about 150 feet from ours. Here's the naked truth: Our well, bedrock at 20 feet, 140 feet total depth, 10 gallons per minute; their well, bedrock at 200 feet, 400 feet total depth, 5 gallons per minute. 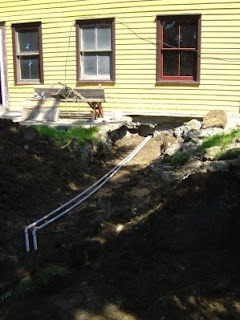 I consider ourselves lucky, and if all goes well, we have the same soft water we had with the old well. We went to the annual library book sale yesterday and bought - to quote our neighbor Julie - stacks and stacks of books that we've no free time to read. There we met - for the first time, and at long last - our neighbors Gia and Rick, both faithful followers of this blog (it was great meeting you guys, please stop by sometime and we'll give you the grand tour). 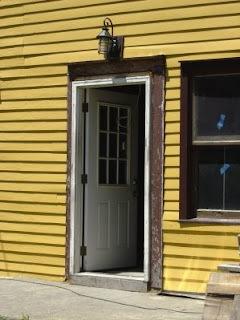 We still haven't found a suitable light fixture for outside the main entrance and the biergarten entrance. So I test-hung one we had bought for around back (for whenever we will build that deck or patio), largely to get a visual (which is always easier than to play things out in your mind). We didn't like how the light fixture appeared above the door, but we also recognized what was missing and how our dream light fixture should look like. As it was early afternoon and neither of us wanted to start anything new (E! 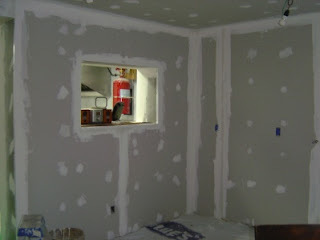 had just finished installing corner beads in the wait station in preparation for taping and spackling the drywall) we went on a shopping trip. Unfortunately we still didn't find a light fixture we liked, but E! 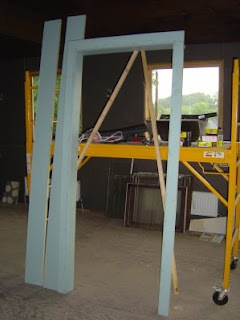 had a great idea on how to build it from an ornamental pot hanging bracket. Stay tuned, it will all be revealed in time. The wait station is coming along. 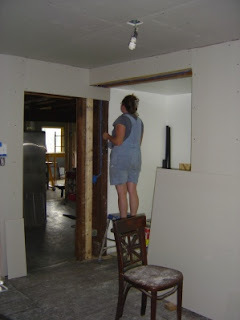 We started drywalling, which always changes the appearance of a room tremendously (especially if you have looked at open walls for a long, long time). Before we close up any wall I usually take pictures, so that we remember where things are. 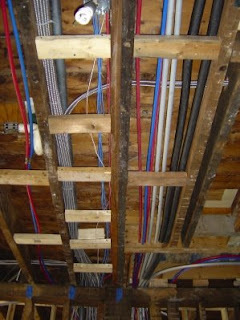 There is good reason to do so, just look at the wait station ceiling, it's a highway of piping and wiring. 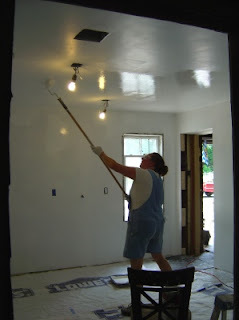 We got about three quarters of the ceiling covered, and could have finished it today, but we both ran out of steam (if we ever had any today) by early afternoon. 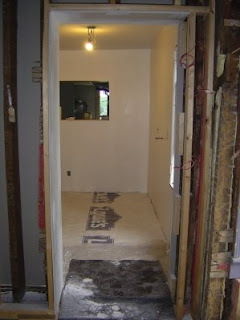 We are definitely on track to finishing drywalling the wait station by the end of the week. I haven't been posting many pictures lately, so here something that should scare the living daylight out of your kids. 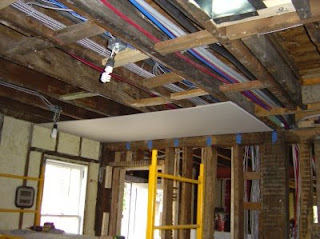 After I had hooked up the wiring on the second floor, I disconnected and removed the original wiring. 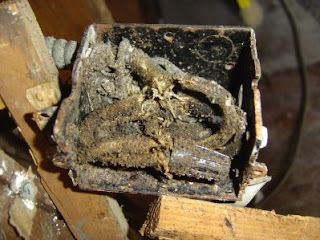 The picture shows the contents of a splice box I had opened in the wait station, a bunch of old cloth wires twisted together, the stuff house fires are made of (this is why I was so eager to cut the second and third floors over to the new wiring). Moving on, we had visitors today. First Greg, our excavation meister. 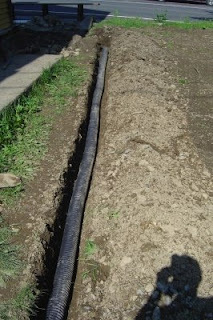 He filled in the trench for the well tubing and wiring, and while he was at it, I had him bury some conduit, which we'll use for outdoor wiring, someday. We also had Lou, our trusty engineer, over. He needed information about our water distribution system, type of UV system, size of pressure tank and hot water tank, and such. 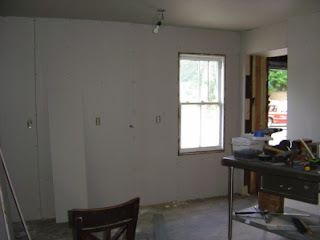 Aside from that we did a little bit of work, preparing the wait station for drywalling, and starting to finish up a few things in the kitchen. I know it was a rough week for you, my readers: Three (non-consecutive) days without a blog post! What's going on?! Well, I told you that we were helping E! 's sister move, but that was only Tuesday and Wednesday. 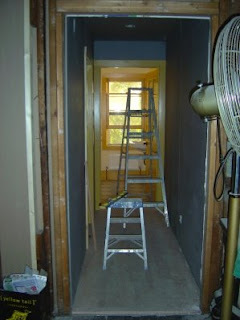 Thursday I was kaputt, but I worked on the second floor wiring (not very exciting, especially nothing picture-worthy). 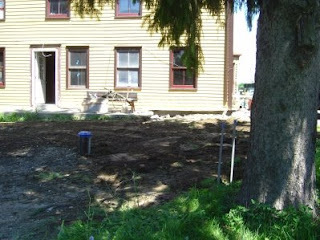 Yesterday I installed light fixtures in two of the second floor rooms, and then went to mow the lawn. It was a great day for yard work. Plus, we knew the day would be cut short as we had been invited by neighbors for a 4th of July party (thank you Carol and Al for inviting us). Today was equally slow. 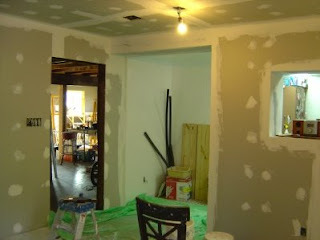 We were mostly planning the wait station (hopefully by the end of the week we will have it drywalled), and shopping for materials (Lowe's had another "Get $10 off your next purchase of $50 or more" promotion, I live for those). I know, none of this is exciting, but it will get better, trust me.